When the name Zalmay Khalilzad appeared on the news as a potential nominee for President Trump’s Afghan peace initiative, different reactions surfaced. Some non-Afghan commentators, though not all, welcomed his appointment given his impressive background. Yet, inside Afghanistan, Khalilzad’s appointment was not much welcomed. Indeed, a group of Afghan political activists set up a petition to urge the U.S. government to reconsider their decision given Khalilzad’s “ethnonationalism motivated” prior conduct in Afghanistan, as the petition put it. Khalilzad is widely acknowledged in the West for his exceptional diplomatic talent. Yet, this is not how he is received in his birthplace. In Afghanistan, Khalilzad is an extremely disputed figure. He played a constructive role in “reaching consensus” by “breaking impasses” while taking an equally troubling attitude in the Afghan ethno-politicking during his tenure in Afghanistan. This problematic background is Khalilzad’s Achilles heel and can potentially damage his reputation and ultimately any incomplete peace, even if he can successfully strike a deal with the Taliban. To understand why and how, we need a bit of history. As in the United States, Khalilzad was rather unknown before 9/11 in Afghanistan. He had worked with the Regan administration on Afghanistan and was introduced to the Afghan Mujahidin. Later at the Bonn Conference, he gained a reputation thanks to his shuttle style diplomacy. Khalilzad managed to convince Northern Alliance leaders to give up on some of their controversial red lines; persuaded Burhanuddin Rabbani to step down from the throne and finally got every Afghan faction on board. After Bonn, however, problematic aspects of his role in Afghan ethno-politics emerged. Amidst confusion over the nascent political, Khalilzad — himself an ethnic Pashtun — and at the time President Bush’s special representative to Afghanistan, dared, as Ahmed Rashird later wrote, “to pull the rug out from under … [King Zahir Shah’s] supporters.” The move weakened the Pashtun’s position in favor of the Northern Alliance and caused some Pashtuns to denounce him, in the words of Rashid in his book Descent into Chaos, “for acting like a British viceroy.” Though the 2004 Constitutional Loya Jirga (Constitutional Convention) ended by any standards in favor of Pashtuns, “many Pashtuns felt betrayed by Khalilzad” as he had manipulated the king. Of course, the controversy over Khalilzad did not end with his troubles among his own ethnic group, the Pashtuns. Indeed, Khalilzad’s posture toward non-Pashtuns has been more contentious. During his diplomatic tenure in Afghanistan, Khalilzad was politically close to the spectrum of Afghan politics known as “reformists.” Admittedly, the reformists were trying to reform the Afghan structure through the sidelining of warlords, but as their Afghan nickname “Liberal Pashtuns” implies, their attitude also heavily gravitated toward Pashtun nationalism. Khalilzad’s troubling role is also noted by researchers. 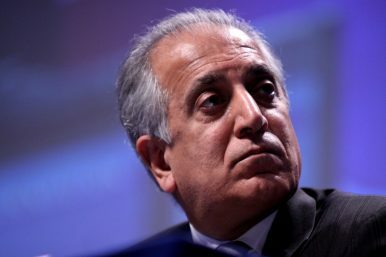 A paper disseminated by the Afghanistan Institute of Strategic Studies, a Kabul-based think tank, has concluded that Khalilzad’s role cannot be ignored “for imposing the presidential system” albeit “through debate and compromises.” Indeed, the paper categorizes Khalilzad’s role in the Constitutional Loya Jirga as one of the eight weaknesses of the convention. This excessively centralized political system — created with Khalilzad in a key role — vested too much power in the hands of the president to the extent that “even schoolteachers would still be appointed exclusively by the central government.” This rigid centralization drove non-Pashtuns to fury, for they wanted some sort of power sharing between different ethnic groups, but instead ended up in a heavy-handed, top-weighted system that benefited Pashtuns. The dominant feeling among many non-Pashtun politicians, since then, has been that the current system was arbitrarily designed to allow Pashtun rulers to constantly conspire against non-Pashtuns. With this modus operandi, Khalilzad had displeased both Pashtuns and non-Pashtuns. His own ethnic group, Pashtuns, accused him of a coup against King Zahir Shah to empower the Northern Alliance. Ironically, the Northern Alliance has constantly renounced Khalilzad for over-centralizing the political system to benefit Pashtuns. This way, both opposing blocks place the blame on Khalilzad in a highly ethnicized Afghanistan. Nonetheless, Khalilzad seems to have maintained the same controversial modus operandi since his appointment as the U.S. Special Representative for Afghanistan Reconciliation. He has gone to extremes in the current peace talks by excluding different stakeholders including civil society, women, and even arguably the Afghan government — chiefly due to a fear that U.S. President Donald Trump may order a pull out amidst the negotiation, if it takes too long. And in case Khalilzad’s version of peace leads to the Taliban’s upper hand or dominance in the coming Afghan government or even worse, cannot end the Afghan quagmire, he will be remembered for another mess. As a son of Afghanistan, Khalilzad perfectly understands that his motherland has been very cruel to her politicians. Indeed, as few empires have managed to leave Afghanistan intact, so have few Afghan politicians survived with a good reputation. Khalilzad looks headed for the same fate, as a satirical mural in Kabul depicting Khalilzad kissing a Taliban member underscores. Sayed Ziafatullah Saeedi is a fellow at the American Middle Eastern Network for Dialogue at Stanford. He is a co-founder at RCDSP, a youth-led initiative that aims to promote dialogue and tolerance in Afghanistan.